This structural thermometer brings industrial artistry to your outdoor space. Your garden is full of complex lines, rich colors, and intricate texture. Why shouldn't your thermometer echo that bold beauty? Chris Crooks believes in blending artistry with technical products, so he crafts this structural thermometer to bring a touch of industrial charm to your outdoor space. 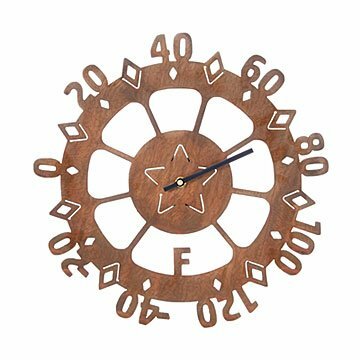 Mount the geometric design on your porch or tool shed and keep an eye on the ever-changing temperature. Handmade in Arizona, where the record high once hit 128 degrees. Chris Crooks took a winding road to get to where he is now—creating imaginative lawn sculptures inspired by the Southwest landscape he calls home. After graduating from the Art Institute of Philadelphia, Chris worked in advertising, then ran a printing business with his wife, while painting during his free time. It was when the couple moved to Tucson that Chris collaborated with a metal art manufacturer and fell in love with the art form. He now designs and creates sculptures in his studio at the foot of the Santa Rita Mountains. "I always wanted to make a living doing something genuinely enjoyable," he says. "To get up in the morning raring to go, and never having enough time to do everything you want to do." Due to the thermometer component, it is suggested that this item be displayed under an eve, overhang, or on a patio, but kept out of direct weather exposure. Bought this as a gift for my mom and she was very happy! It looks very cute on her garden shed. A great gift for an outdoorsy uncle. He said he loved the design and immediately put it up outside. Very well made. The weather doesn't seem to be predicted correctly in my area. We wanted to look outside to see the real temperature so we know how to dress for golf. It is very accurate.